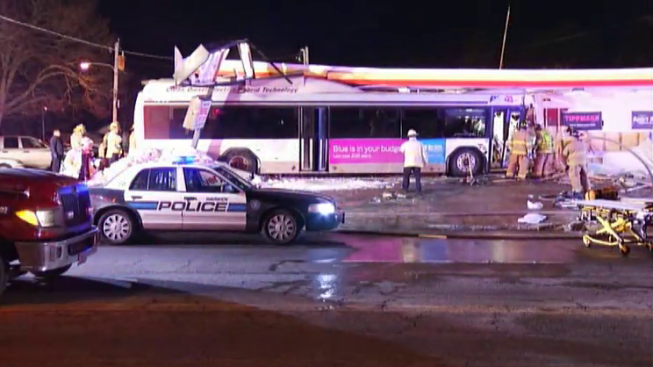 Officials say the driver of a Rhode Island public transit bus that crashed into a building may have suffered a medical emergency that also caused him to strike a telephone pole, toppling it. Warwick police say 51-year-old Richard Avedisian of North Kingstown and two bus passengers were taken to the hospital with serious injuries following the crash around 7:15 p.m. Monday. A third passenger left the scene but later was interviewed by police. Rhode Island Public Transit Authority spokeswoman Barbara Polichetti says the bus struck a telephone pole in the right lane and then veered across three lanes before crashing into a commercial building housing Rhode Island Paintball & Airsoft. A website for the business says it is closed on Mondays. When the bus was removed, part of the building's roof collapsed.